Hi there and thanks for dropping by Flawed yet Functional today! I am an adult onset Type 1 Diabetic working through the reintroduction phase of the Autoimmune Protocol (slowly…very slowly…), and I’m happy to report a successful Stage 3 AIP reintroduction: cashews! It’s been so long since I’ve done a reintroduction, let me bring you up to speed with what I’m doing. Take one small bite of food then monitor reaction for 15 minutes. If all is well, then take a full-sized bite and monitor reactions for 2-4 hours. 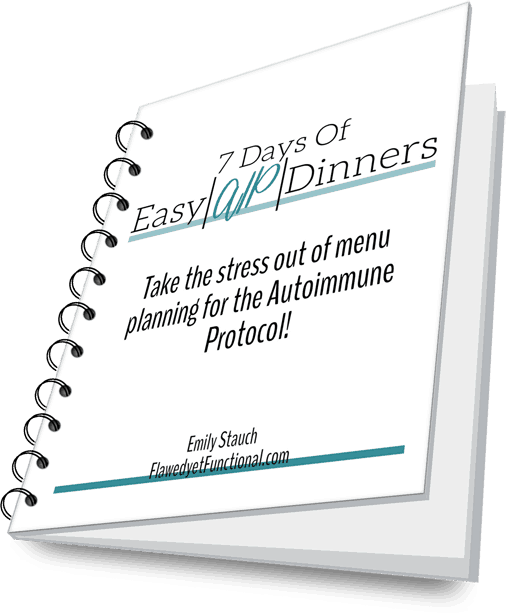 Then if no reaction occurs, eat one full serving and monitor symptoms for 3-7 days before reintroducing another food. The only failure reintroduction has been eggs. I know that I am highly sensitive to dairy too, so I have not tried any of the dairy products in the reintroduction stages: ghee or grass-fed butter. The four stages are below for reference. After I reintroduced insulin to my health routine, my blood sugar quickly stabilized. My goal was to wait for two weeks of stable blood sugar before attempting a reintroduction. However, I went low during a grocery shopping trip and inhaled a Larabar that had cashews in it (I didn’t read the label carefully…or really at all!). Well, I guess I’m testing cashews with only 5 days of stable blood sugar! Success! Reintroducing cashews opens up not just snacking options, but all sorts of sauces for dinner. Danielle Walker has an awesome chicken and cauliflower rice casserole that uses soaked and blended cashews as the sauce. It’s so delicious! There are tons of other uses for cashews in appetizers, butters, and desserts. I’m so excited to incorporate these into my diet again! After almost six months of no changes to my diet, I’m so happy this Stage 3 AIP Reintroduction of cashews was successful. Stable blood sugars and nibbling cashews has made me a happy girl lately. What a great start to the new year! Any victories in your health lately? Have you made any changes since New Year’s Day? Do you have any success (big or small!) to share?